This is a sampling of the Chessie & Me collection! 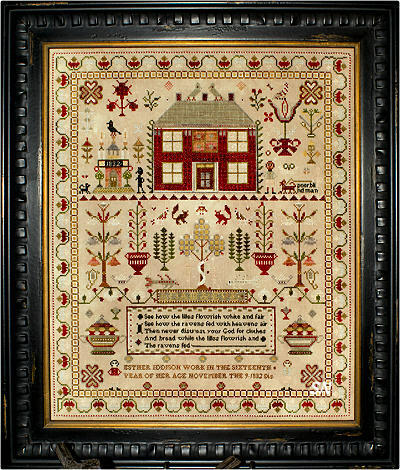 Delightfully small, detailed samplers, each is stitched over two linen threads, but always features areas stitched over one thread as well. 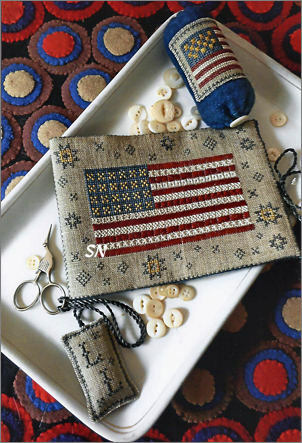 There are always special stitches in them... the little flag design is full of them! Pretty colors, nice verses... enjoy these we've stitched in the shop! Chessie & Me's newest semi-annual kit is here. We brought it home from market last month, but needed to wait till a thread shortage was corrected to share it! Linda's charming flag waving from the skinny white house on the edge of the shore... gotta love that little whale out there! Her complete kit comes with Silk Weaver's 36ct Cider Linen and luscious hand-dyed silks by Gloriana. Denim and Navy blues, an olive green, cream and a gorgeous, brilliant, true red, this finishes approx 3-1/2 x 4 inches in size. This joins Linda's serious set of small cushion kits... I think we have 15 so far! Friends of the Mill - Good Friends are hard to find, harder to leave and impossible to forget. 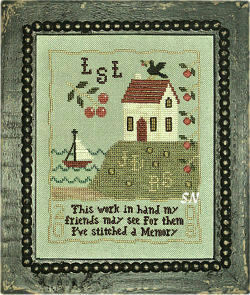 Designed as a retirement piece for one of Linda's friends... what a special piece this would be to stitch for a friend moving away. 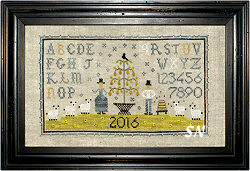 Weeks and Sampler Threads used, this finishes approx 5 x 9 on 32ct, four sided, eyelets over 6, and always Rice and Smyrna Crosses featured! 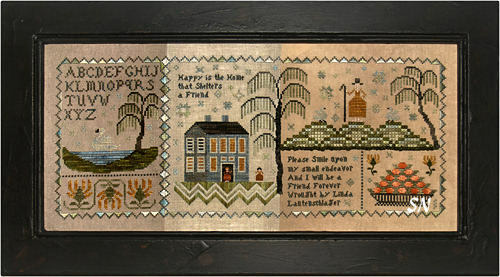 Let My Examples Shine - This is a neat 3 x 7 needle roll case stitched on Weeks 36ct Confederate Gray linen. You'll need one of our 'Schnigglet-sized' 8 x 8 cuts of Week's Whiskey Houndstooth Wool for the lining, and Classic Colorworks and Weeks flosses for the stitching. There is a good photograph inside the chart of the case inside, and complete finishing instructions as well. 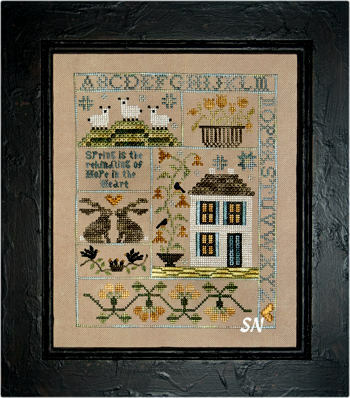 Sarah's Basket - This is a take-out design from Linda's new sampler - one that Sarah stitched in 1848. 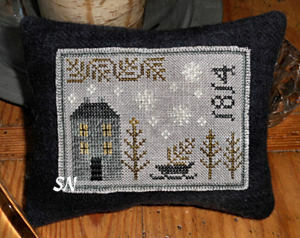 Worked on 36ct, the pin pillow finishes a generous 7 x 14! Weeks and Classic Colorworks hand-dyed cottons on here... it's basically the top 1/3 of the sampler, but Linda has changed some of the flower baskets. 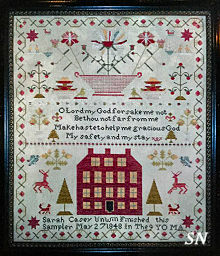 A reproduction of Sarah's Sampler, this finishes approx 16 x 13-1/2 on 36ct linen. Stitched with Classic's Barn Door, Black Coffee, Peanut Brittle, Polliwog, Shabby Sheep and Week's Cayenne, Dolphin, Garrison Green, Lancaster Red, Putty, Red Pear and Sanguine... pretty, pretty colors! 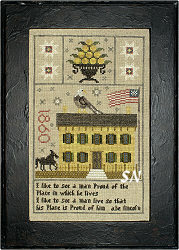 This one finishes approx 8-1/2 x 11 on 36ct linen, and is stitched with Classic Colorworks hand-dyed cotton flosses. You'll need 2 skeins each of Cherry Cobbler and Pine Needles, but one each of Barn Door, English Ivy, Hazelnut, Hickory Sticks, Onion Skin, Tartan Plaid, Tennessee Red Clay and Wavy Navy. 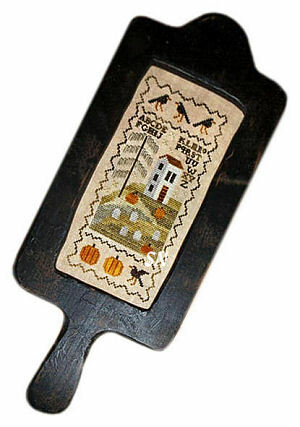 Halloween Mini measures only 35 x 55! 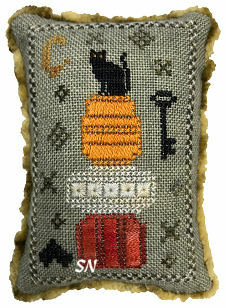 Stitched on Weeks Dye Works 32ct Confederate Gray linen with 6 shades of hand-dyed Gloriana Silk, you have Satins, Smyrnas and Eyelets over 6 in your pumpkins and that darling Chessie-The-Kitty over one. This is only 2-1/2 x 3-1/2! Super, super cute, the kit contains the chart, linen and silks! Christmas Cabin - This is pretty! Worked on 36ct Lakeside Linen Pear, you have 8 shades of hand-dyed Gloriana Silk in here. Always the Satins and Eyelets over 6, this one finishes 2-1/2 x 4-1/2 inches. Rich deep colors of cherry red, mossy green, frosty gray and woody browns, that tiny cabin looks so inviting! Chessie's Semi-Annual Little Kit, this one is quiet, simple and respectful of the Season! 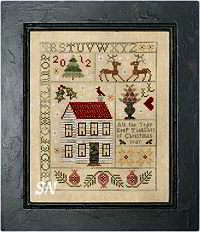 Stitched on a mangy green-grayed 32ct hand-dyed linen by Lakeside -- Vintage Wood Smoke -- it is stitched with Gentle Art Sampler Threads of Mustard Seed, Piney Woods, Raven, Shaker White and Tin Bucket. A few Smyrnas and Satins, it's just a bitty thing finishing at 3 x 4. 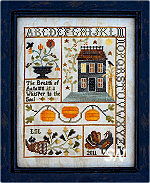 Offered as a complete kit, it contains the chart, linen and threads. Chessie & Me! has several new things. Here are pics of a few, the rest are shown below. 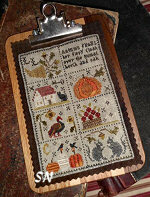 Quaker House Token -- This is Linda's small kit for this season, stitched on Zweigart's 36ct Cedar Linen. She has motifs stitched over one and two worked with Gloriana hand-dyed silks of Antique Black, Chocolate, Mocha and Old Gold. 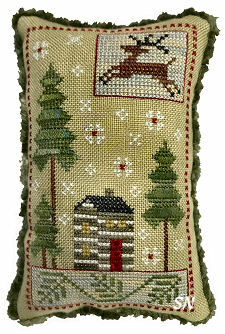 A charming little cushion, it finishes just 3 x 4-1/2 inches in size. Presented as the complete kit of chart, linen and silks. 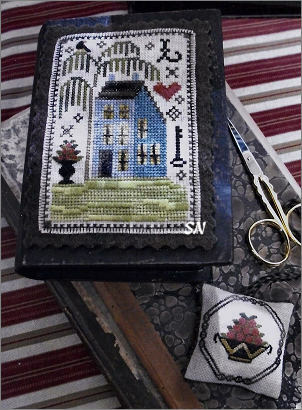 Garden House -- This companions Linda's Garden House Stitch Book --same pretty colors, motifs, etc. This time, you can make a fob and a cushion, but she shows it wrapped around a scissor block! (blocks are all different sizes, you might lose a tree or two on the sides! The one pictures has 9 holes.) Stitched with Weeks flosses on 32ct Weeks Beige Linen the wool featured in the finishing is Week's Cinnabar Houndstooth pattern. Any of the 4 wool finishes -- herringbone, houndstooth, glen plaid or solid will look good on the finished pieces -- you don't see enough of the pattern to matter... and if you aren't a pink gal... go green! (we can help choose wools for you.) Anyway, main sampler finishes approx 2-1/2 x 7 (a long skinny cushion size), the initial square measures 2 x 2-1/2 and the fib is under 2 inches in size! A charming set, with a neat finishing idea! Home Safe to Me -- A bitty seaside-inspired needlebook and fob set, you are making a Pyn Keep to match as well. Everything is stitched on 36ct (you can choose anything you want), and each piece is stitched on both sides. 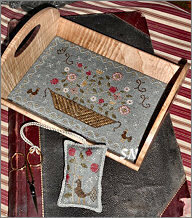 The Needlebook finishes about 4-1/2 x 9, -- wool pages inside -- it features Linda's trademark design of Satin Stitches mixed in everywhere, Smyrnas as well, and some motifs over one. Her things always have lots of pretty texture because of the stitches mixed in. So... if you don't want the set of smalls, this could simply be a 4-1/2 inch square cushion. The matching scissor fob is under 2 inches -- whale on one side, tall ship on the other. The Pyn Keep measures just 2 x 2 -- mermaid on one side, anchors on the other. 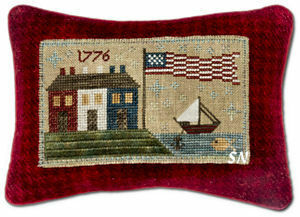 Stitched with a combo of Weeks and Gentle Art flosses -- gorgeous colors! 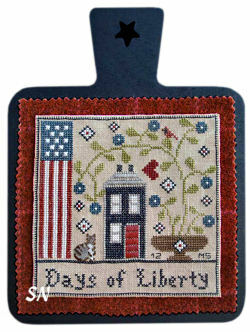 Linda's semi-annual mini-kit is here... a peaceful cabin with a patriotic summer sky. Just a 3 x 4-ish thing, this is offered as a complete kit of 36ct Vintage Woodsmoke hand-dyed linen by Lakeside, with lengths of Weeks and Gentle Art hand-dyed flosses. 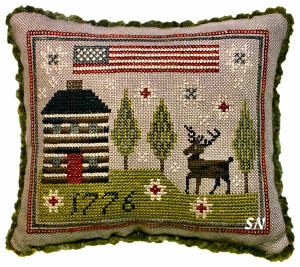 Linda always incorporates special stitches into her designs -- this one features 4-Sided and Long Arm Crosses all along the border, a cabin roof entirely of Smyrna Crosses, Satin Stitches as the cabin logs, and the Stag, which is worked in tent -- one thread over one thread. Great flag across the top -- I don't see the little Chessie Kitty! (You might have to dig into your Chessie stash to find that little guy on another chart, in case you want him in here!) Pretty shades of deep greens, brick red, and charcoal grays. 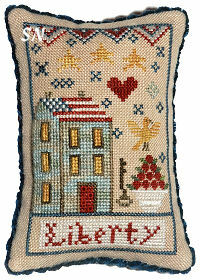 Chessie & Me's Linda Lautenschlager has several new designs -- Summer Liberty is her new annual *house* kit! Absolutely charming this year, the denim blue house is stitched on Weeks Dye Works 36ct Confederate Gray Linen with Gloriana hand-dyed silks. Fabric AND silks are included in the kit. Finishing approx 3-1/2 x 4-1/2... you get the waving flag, the charming house, the little Chessie Kitty over one thread, and that GLORIOUS green yard. Just alternating blocks of Satins between crossed lines, it really has a lot of texture and just plays with whatever light it has! This year's edition one of my favorite kits of hers! 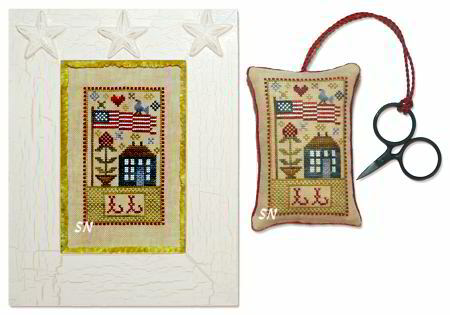 A pair of designs featuring smalls, finish everything into cushions or fobs... or maybe even paper box tops. Both are presented as charts. Out on a Limb is charted for hand-dyed flosses and offers a needle book (2-1/2 x 6), pyn pillow (3 x 3) and fob (1-1/2 x 1-1/2.). Linda suggests Mountain Mist Weeks Wool for finishing, so that should give you a color sense for this. Nettie Brown also uses Mountain Mist wool for piece backings, but is charted for silks. The main design is just 4-1/4 x 2-3/4 in size!! Bitty little things! 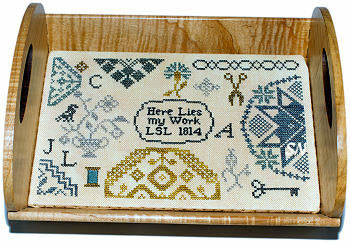 Stitched on 32ct, this fits a tray that Linda has used on some of last year's designs. Charted for Weeks hand-dyed flosses, it finishes only 4-1/2 x 7-1/2. Finishing 5 x 9 on 32ct linen, this is stitched with Classic Colorworks hand-dyed floss. There are Eyelets over six in the grass; Satins in the beehive, and the pears on the tree are over one! Finishing approx 5 x 9 on 32ct Weeks Tin Roof Linen, it is stitched with both Classic Colorworks and Weeks hand-dyed flosses. Huge, it finishes approx 15 x 17-1/2 on 32ct and takes 64 skeins of the wool!!!!! (We can fix you up with those wools -- only $240!) You can convert to cottons because the color names are the same... very, very, very pretty! Very simple and primitive, this is stitched on 32ct Tin Roof Linen with Sampler Threads of Mulberry, Maple Syrup, Mustard, Parchment... and a few more. 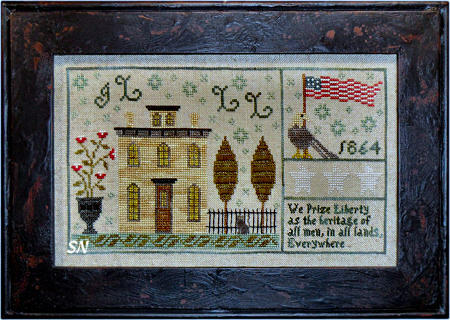 It finishes approx 4 x 6, and features Long Arm Crosses in the border and Satins on the roof. This makes a petite two-sided pin cushion. Kind & True is over two and measures 3 x 3... Forget Me Not is on the reverse, and is over one. Worked with Weeks flosses on Weeks 32ct Beige Linen, the box featured is from Doodlin Around Design. *When this you see think of me, tho many a mile we distance be. 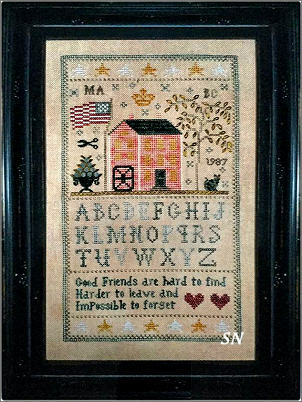 * A sweet friendship sampler, this is worked on 32ct linen woth both Weeks and Gentle Art Sampler Threads. 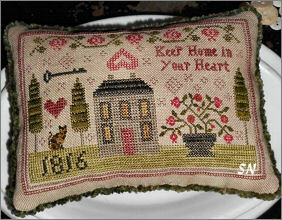 Finishing approx 5 x 9, this make another pretty cushion with just the house and verse! 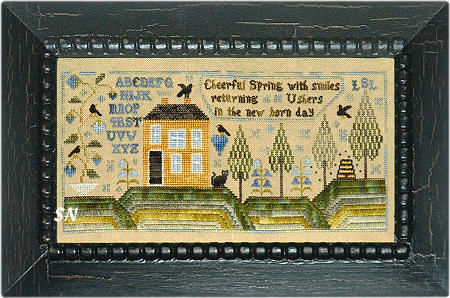 Three different alphabet fonts and those darling Chessie Cats over one, this fits in the same tray as Linda's previous designs Floral Sampler and Friendship Garden. Choose Weeks 32ct Confederate Gray linen, this is worked with Weeks and Gentle Art hand-dyed flosses. Four-sided stitches, Smyrnas and Eyelets, Linda has some of those over 4 threads rather than two. The little wiener fob needs a Schnigglet cut of Wool -- Mountain Mist is featured on the model, but you can choose any wool color that matches some of the flosses used. Chart is separate from the tray. Chessie & Me has sent AWESOME new designs! Four new charts, along with her annual *house kit*... everything is here, and we love it all! Linda always adds specialty stitches in her designs -- Rhodes, Eyelets, Satins, Smyrnas, Rice... always lots of cute details to make her designs POP! All of these feature those extra design and stitch detail. Autumn Blessings -- Look -- this is finished on a half-sized clip board!!! Stitched on Weeks Dye Works 32ct Confederate Gray Linen with Weeks and Gentle Art hand-dyed cottons, it finishes approx 4-1/2 x 6-3/4. Eight little squares -- they'd make cute scissor fobs and name tags if you did them separately -- do whatever you want! You'll need one Schnigglet cut of Weeks Wool for your backing -- you can see Chestnut in the model pic, but we have pumpkins, grays, golds and charcoal blacks as other color options -- and you can use any of the 4 finishes -- herringbone, houndstooth, solid or glen plaid! If you decide to make a set of pin cushions... get a couple of different wool cuts so your backs coordinate! Keep Home in Your Heart -- Oh this is so sweet!!! Worked on 32ct, it finishes approx 4 x 6, and is stitched with Weeks of Aztec Red, Baked Apple, Bullfrog, Flatfish, Grasshopper, Onyx, Pink Sand, and Schneckley. HUGE on Chessie charm!!! Floral Basket Tray with Fob -- Rich colors of Weeks hand-dyed cottons are set against 32ct Weeks Dolphin hand-dyed linen to give you this subtle basket of flowers. Nestled in a sewing tray add a pair of special scissors -- because you can stitch a matching fob for them! Eyelets and Smyrnas in the flowers, the basket features short Satin stitches. The tray is the same one Linda featured in her Friendship Garden pattern from this past Spring. Not a tray-person? That little basket will finish a mere 4-1/2 x 7-1/2 and it would be lovely as a cushion of measurable size!!!! Piney Woods Tray & Pyn Keep -- This is a medium-sized pin cushion piece - it finishes approx 4 x 6 on Weeks 32ct Confederate Gray linen. Weeks flosses of Cadet, Grasshopper, Hazelnut, Oscar, Schneckley, Sea Foam and Swamp Water -- it has restful, 'Northwoodsy' kind of colors! The chart includes the tiny band design that wraps around the baby felt needleroll, instructions for IT included as well! Chessie is always over one thread, the whole thing finishes just under 3 x 4... Linda has about a dozen of these small kits, and we have, and love them ALL! New Chessie is Here Now! A Gathering of Sheep -- Chart. 32ct Weeks Tin Roof. Weeks flosses of Bullfrog, Grasshopper, Havana, Kohl, Putty, and White Lightening, it is presented in a wooden Tool Caddy. 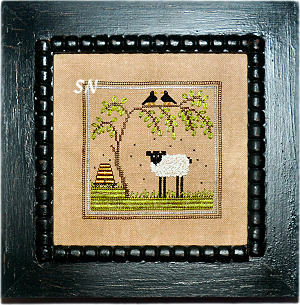 The main design features Linda's fun Satin Stitched grassy hills and you COULD stitch those sheep with Gentle Arts Simply Wool and some French Knots if you want to be a show-off! The pattern includes the needlebook, fob and caddy designs. This calls for three small pieces of linen, sizes vary, approx cost for all is $17. You'll need some Kohl Houndstooth Wool to back everything -- a fat quarter should be enough for you and a friend to share. Friendship Garden -- This is lovely! 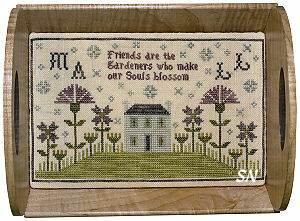 Retromantics mini-tray of brown, Weeks 32ct Parchment Linen... 'Friends are the gardeners who make our souls blossom.' LOVE the colors and the balance in this... and your friend (the one you stitch it for!) will love it too!!!!! Worked in Sampler Threads and Weeks flosses, this finishes approx 5 x 8. Grant House 1865 -- A chart... 32ct Confederate Gray Weeks linen, yummy hand-dyeds by Gentle Art and Weeks, pretty for a hallway or foyer... 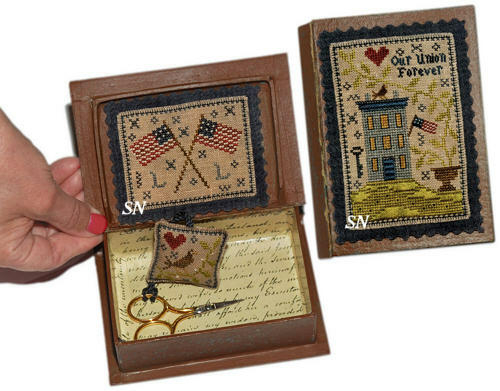 I like just that Preserve the Union block for a smaller framed piece or pin cushion! Finishes approx 5 x 9. 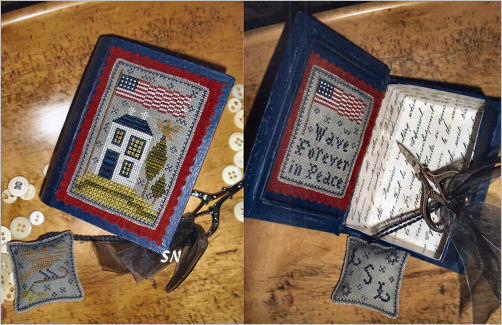 Delaware House -- This is another of Linda's charming BOOK BOXES. 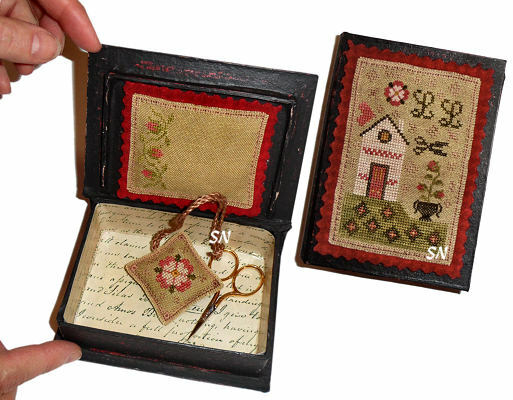 Stitch her little house and matching fob on hand-dyed linen -- overdyeds from your stash -- and get one of her paper mache' brown paper boxes that is shaped like a 3 x 4 x 1 miniature book.. It features an opening lid -- like a real book. (Not a Kindle!) Paint your box with acrylic paint from the big box store, polish it with a little shoe polish (honest!) and you have a REALLY COOL vessel to show off this charming set of smalls! 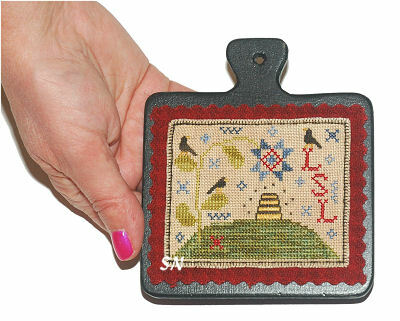 Linda has like 6 other designs in this miniature book series -- they are all on our Chessie pages!!! This calls for Chestnut Houndstooth wool for linings. Kind of dark, think about Dolphin, or one of the green shades to brighten the edges a little. Again a fat quarter will serve both you and a friend. 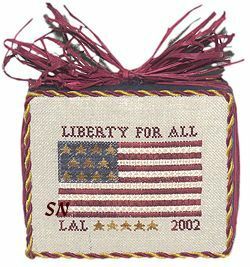 Flag of Glory -- chart... 32ct Tin Roof by Weeks, Freedom, Mulberry, Mustard Seed, Shaker White and Tin Bucket Threads... the flag stripes feature different specialty stitches in each one for a little of extra texture, and check out that matching miniature wiener roll in there! 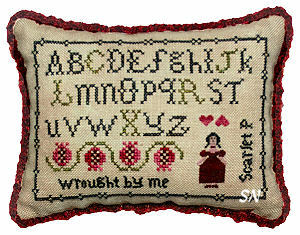 What a fun design to stitch and a neat set to have and use! ***Watch the mail order catalogs for shadow boxes and coffee tables that have display areas under glass. GUESS WHERE YOU CAN DISPLAY all these beautiful little sewing sets and pin cushions you love to stitch and collect??? You'll need 4 cuts of linen -- along with a quarter yard cut of Weeks Deep Sea wool -- Solid, Herringbone, Glen Plaid or Houndstooth will all work beautifully, or if you'd rather, we could choose an awesome red that matches the threads. Just let us know! Her stitch details are in here everywhere -- Satins in the border, evergreens, roof and grassy areas, and the stones in the river. Colorful and really unique with that two-color fabric thing going on, this finishes approx 5 x 9 and is coded for Gloriana silk or DMC floss. You could always convert those solids to cotton hand-dyeds too. Offered as a chart. Chessie & Me has released one of her cute *Book Box* designs this week, with a matching sewing case and fobs that could store inside the little box! We love these small paper mache book boxes Linda uses -- she paints and waxes them, and stitches for the top, sometimes the inside of the lid, and sometimes the box bottom. Always bits of Weeks Dye Works hand-dyed wools to line or compliment the needlework, Wave Forever is stitched on 36ct Lakeside Vintage Cedar Plank Linen with one strand of hand-dyed floss. All of Linda's Rice and Smyrna Stitches, the billowing flag appears on the 2-1/2 x 4-inch box top and on the inside. The Lady Liberty set is worked on Weeks 32 Beige Linen, so it technically doesn't MATCH the other... but we do like them together. 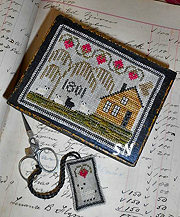 The needlebook finishes approx 3 x 6, the fob is just 2 x 2, and Weeks Deep Sea wool lines the little case. TOO CUTE! Each is offered as a chart, wools and linens separately. 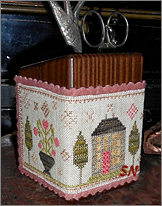 Here's a delightfully small paper mache box that is dressed up with a tiny sampler saltbox scene. 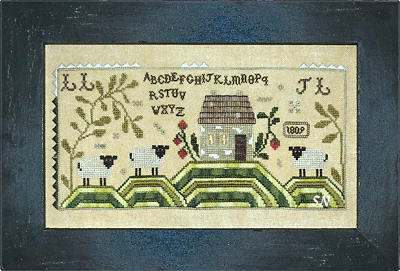 Linda's charming touches of special stitches are in the grass, and door, and the little sheepies are all over one. By Chessie & Me, this kit includes the chart, Weeks 32ct Confederate Gray hand-dyed linen, yummy Weeks hand-dyed flosses, your needle and that little 4-3/4 x 3-1/2 x 2-ish inch brown box. Leave it natural, or paint and wax your box... either way, it'll make a fun storage piece for something small and important! Chessie & Me's annual mini-kit, this year we have another cool seacoast theme... I love that little tall hill with the house perched on top! Offered as the complete kit, this is stitched on Lakeside Linens 36ct Vintage Meadow Rue Linen with Gloriana silks of deep red, denim blue, gold, mossy green and a touch of golden brown. 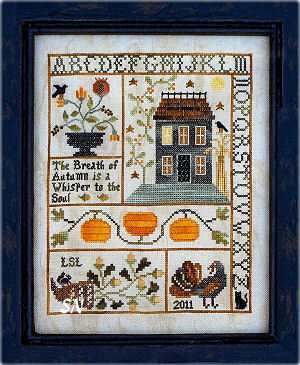 Another seasonal hornbook design, this goes with Winter Wonder, Harvest House, Days of Liberty and Scarlet's Summer Sampler. Finishing approx 5 x 5 on 32ct, you can see a bit of Week's Red Pear wool peeking out from behind to add that soft wool mat of color. Threads are all Weeks and Gentle Art hand-dyed flosses... you have the kitty over one, a Nun's Stitch border, Satin stitched roof, French Knot flower buds and Smrynas all over the place! Such a pretty piece, a schnigglet cut of the Red Pear (hand-dyed by Weeks, it comes in a 'solid', herringbone, houndstooth and glen plaid pattern... we'll send one of those options) is all you need for that backing. Wooden and paper boxes for finishing abound at Hobby Lobby! Offered as a chart. Are you collecting these fun paper mache book box designs??? Tudor Rose is the next in Chessie's Set of these CHARMING 3 x 5 x 1-1/2-ish brown paper boxes. (We'll have them in stock again as soon as all the west coast shipping delays are resolved... they're stuck on a dock somewhere!) 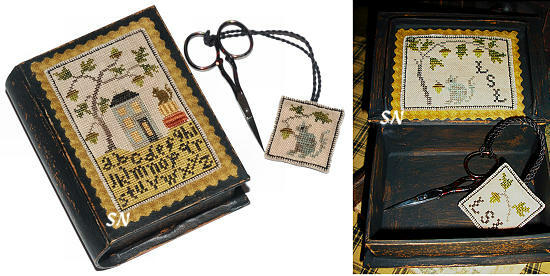 Paint and wax your box, and mount the needlework to the top, inside lid and make the matching fob. Lots of Nun Stitch, Satins, Smyrnas, and Eyelets, this uses Weeks flosses of Aztec Red, Bullfrog, Cappuccino, Grasshopper, Peach Fuzz, Swamp Water and Whiskey. You'll need to use 36ct to get it to fit the box, and will need a schnigglet cut for the backing on the top and inside lids. (We'll send the Louisana Hot Sauce color in either solid, houndstooth, herringbone or Glen Plaid. We can reserve boxes for you... but will not hold shipment for them to show up!!!! 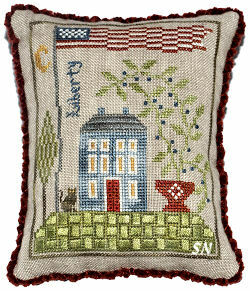 Others in this cute set are farther down this page - Patriotic Stitch Book, Berry House, Queen Bee and Autumn Sewing! Linda writes about this piece,"In designing this Civil War era piece I wanted to give it a Wisconsin flavor, and discovered the home of William Tallman in Janesville, WI. ...part of the underground railroad, it became a stop for slaves traveling to freedom in the North. ...discovering that the Tallmans were friends of Abraham Lincoln, the president stayed here on several occasions." 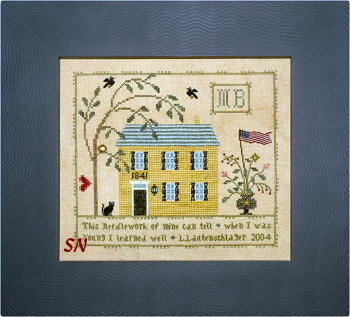 So she felt it appropriate to include this lovely old house in her sampler! Verse is taken from Lincoln's second inaugural speech, and the eagle was the mascot of the Eighth WI Volunteer Infantry Regiment! 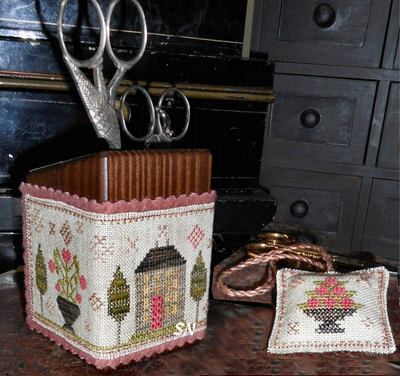 Worked in Sampler Threads on Week's 32ct Tin Roof Linen, again, this is stuffed full of Linda's favorite stitches of Eyelets, Smyrnas and Satins! Finishes approx 5 x 9 and is offered as a chart. 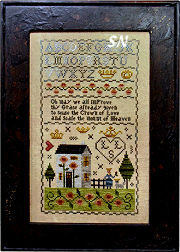 This sampler features lots of crowns and is actually a little brighter in color that some of Linda's other pieces. 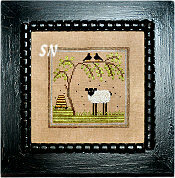 Charted for Gloriana silk or DMC floss, on 32ct it finishes approx 9 x 5. Smyrnas and Satins... *oh may we all improve thy grace already given to seize the Crown of Love and seale the mount of Heaven. * A pretty little piece, offered as a chart. Grab a 7-1/2 inch round brown paper mache box and either paint and wax it or cover it with fabric like the one in the pic. 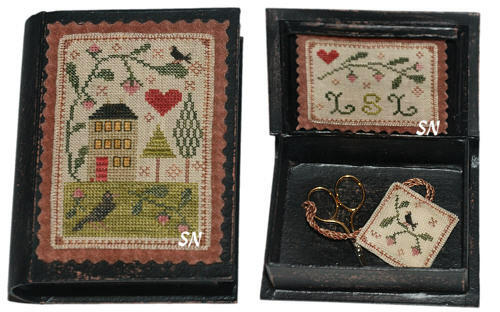 Next, stitch all your little motifs for all the pieces in this charming sewing set on 32ct linen. It is charted for Sampler Threads of Caramel Corn, Old Hickory, Piney Woods, Shaker White and Tin Bucket. Eyelets over 6 threads on the door, Smyrnas and Satins all over the place! The needle book finishes approx 3 x 6, Pin Keep Roll is 2 x 4-ish, and the fob is 1-1/4 x 2! You will need TWO schnigglet cuts of Week's Chestnut wool -- we'll send matching cuts of either the solid, houndstooth, herringbone or Glen Plaid. All the finishing instructions are in here... nothing too difficult... just a cute set! Presented as a chart. Lovely, relaxed goldens, grays, creams and blacks... this is a stunning little sampler! Liberty is the only thing you cannot have unless you are willing to give it to others. 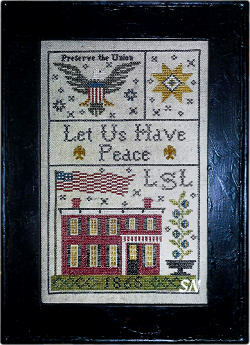 Linda's inspiration for this comes from the Civil War period -- it honors the brave souls who aided the courageous 'travelers' on the underground railroad during that time period. She's included several quilt pattern motifs believed to have directed the 'passengers' along their route... the Northern Star, Flying Geese and 2 Log Cabin variations. Stitched using Sampler Thread hand-dyed flosses this finishes approx 5 x 9. As always, Linda has special stitches scattered all over in here... can you see them as the bricks on the house and the lines on the beehive? Windows have over-one detail... and there is Chessie up in the tree! Offered as a chart... linen separately. Linda's annual small kit, this year's is a haunted hotel with a graveyard on the property instead of a swimming pool! The Boo sign outside welcomes the preferred guests... I guess it means 'vacancy??' Offered as a complete kit, Linda has 36ct linen in here along with 7 lengths of hand-dyed Gloriana silks! Luscious mossy greens, a hint of gold, some brilliant orange and of course, a kohl black, there is a bit of one-over-one and some Smyrna Crosses tossed in. 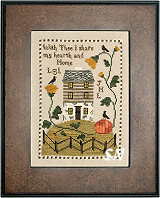 Finishes approx 3 x 4 -- we still have all of Chessie's other small kits available -- cute seasonal houses, a ship scene, and some primitive pumpkins and birds from years past. This 3 x 4 miniature sampler is worked on a 36ct linen and mounted to the top of a paper mache box that is shaped like a small book -- that actually opens! Worked with all three brands of hand-dyed flosses, Eyelets and Smyrnas are here and there, as well as one-over-one detail. Box lining is simply paper, but you can choose lots of varied Week's wool colors (2 -- one for the outside and another for the inside.) to back your topper piece and the inside box top area. 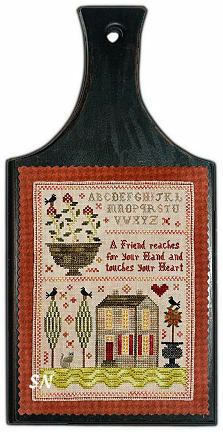 Offered as the chart, you get both the top sampler (which companions her Berry House and Autumn Sewing Boxes) and the inside top design, along with the matching little fob chart! These charming boxes are such a fun and different way to finish and display your stitching... they are super easy to paint and wax as well! Inexpensive and really cool finishing! 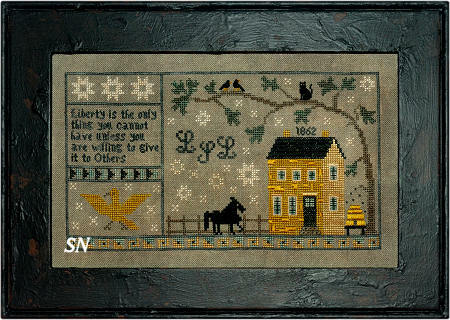 The next two in the 'Seasons of Chessie' Series... these join 'Days of Liberty'... so we still have a few seasons to go! Approx 80 x 80 in stitch count, each is worked with overdyed flosses on 32ct linen, and accented with a piece of Week's wool behind it for an extra punch of color! Chessie's special stitches in these - I LOVE the kitty on the barn roof!!! Winter is worked on 32ct Linen -- a medium steely blue/gray with a Louisiana Hot Sauce wool accent, while Harvest is worked on a creamier linen with a Terra Cotta Wool backing. Offered as charts and so DARN cute... wood pieces come from Hobby Lobby! The straggly willows, ghosts all over the yard and pumpkins instead of hedges... *Shadows of a thousand years rise again unseen, voices whisper in the trees tonight is Halloween* That's an eery verse!!! 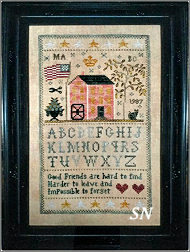 !Finishing approx 5 x 5 on 36ct linen, frame this, pillow it, make a cube stand-up, or a quilted door hanging. 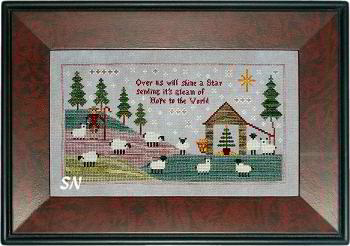 Charted for silks or DMC, there are always fun stitches scattered about for definition. 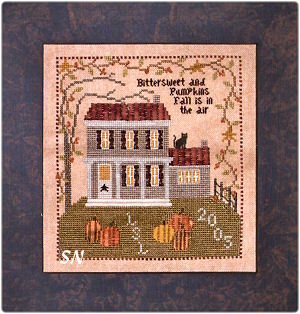 The border, door, cats and pumpkins in the yard are all worked in Satins, Rices, Smyrnas, the chart just LOOKS like it'll be fun to stitch! Here is a new Chessie & Me design that is very much *Chessie* in personality! Worked on 32ct linen with Weeks overdyed flosses, it'll finish approx 5 x 5. You can get blank wooden shapes at Hobby Lobby like the one shown on the cover -- a little bit of paint -- and presto -- a cute finishing option. Choose a bit of Weeks hand-dyed wool to back the stitching before you mount it, and you get an extra punch of color. 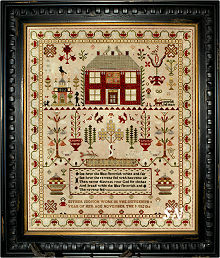 This is quite a sampling of stitches, motifs and verses! 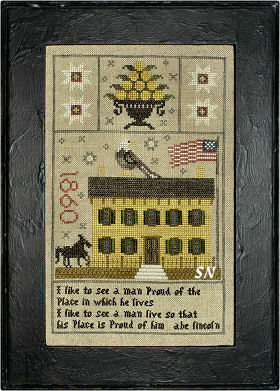 Stitched on three separate pieces of three different colors of 32ct linen, each section features a different scene and sentiment. *Please smile upon my small endeavor and I will be a friend forever* and *Happy is the home that shelters a friend* are the two verses... there are lots of palm trees, and TONS of gorgeous stitch details. There are stitches and trim that cover the fabric seams helping each of the three panels of fabric naturally divide the piece. You can stitch this all on one piece of material, but this is kind of a neat alternative! Offered as a chart. This is a three-part set of designs that fits on the top and inside lid of a 3-1/2 x 5 x 1-1/2 paper mache box that looks like a book! 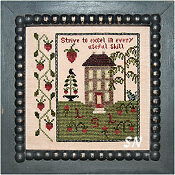 A companion to Chessie's Autumn Sewing Book, this is a summer scene of a little house surrounded by a lavish berry vine. There is a small fob to fit inside, and an initial panel to decorate the inside lid. Charted for Weeks overdyed floss, this needs to be worked on 36ct linen to fit the box -- simple brown paper mache, shaped like a book, that features a tilting lid. You'll need to paint it to get it to look like the pic, but the effort is worth it! Berry House is offered as a chart; box is separate. Another Companion Book Box to Berry House and Autumn, this is the CUTEST! Offered as a chart, this includes a design to line the interior lid of a box, it includes a two-sided fob, and a band to wrap around a miniature hot-dog-shaped needle cushion! You'll need to paint your 3-1/2 x 5 x 1-1/2 paper mache box first -- Linda added her initials on the top. Inside, you'll see the *It's good to Bee Queen* stitched on the lid. Next, the scissor fob has a skep on one side and bee on the other -- more room to add initals and dates, too. Then, that mini-needleroll made of Weeks Whiskey Houndstooth wool steals the show! See the stitched band wrapped around it? Just a really neat finishing idea for a cool finished project. Offered as a chart with box separate. Classic Chessie & Me! *Spring is the rekindling of hope in the heart. 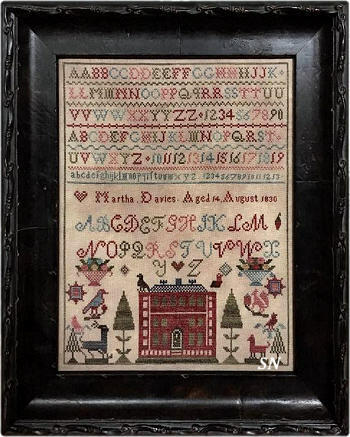 * Measuring approx 6 x 7-1/2 on 32ct linen, this piece is full of smaller sections -- each with motifs that feature lots of Satins and Eyelets in their stitch details. 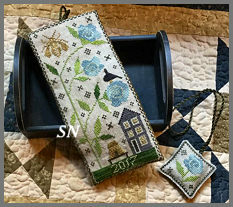 Linda chose silks or DMCs of soft denim blue, antique golds, taupe (for the bunnies) and dirty white (for the sheep and house), and lots of pretty greens to create her Springtime scene. I think I like the play of the yellow and blue colors the best! Offered as a chart. Pretty terra cotta farmhouse with lush green borders and grasses, sheep and windowpanes are over one. Lazy Daisies in the tree, Rhodes in the front door -- Linda always adds so much texture and interest with her use of specialty stitches! Offered as a chart. Linda's 2014 kit, this is a departure from her seasonal houses. This year we get a patriotic row house surrounded by Chessie's classic *lawn. * She always does rows of Satins for grasses and they just glisten! Then on the other side, we get a sailing ship over one thread, a fish and anchor in the sea, and that billowing flag in the sky above! So absolutely chaming!! 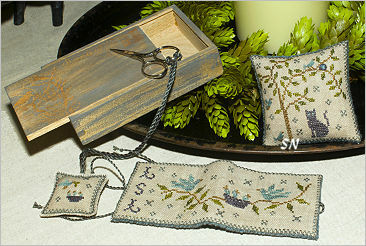 This is offered as a small kit of chart, 36ct Vintage Pear linen by Lakeside, and hand-dyed silk by Gloriana. It finishes a petite 2-3/4 x 4... our model is mounted onto a bit of Weeks red houndstooth wool, and made into a little pin pillow. Shepherd's Christmas is a sweet pastoral scene finishing approx 5 x 9 on a dusty blue linen -- we have tons of great choices on that. Satin Stitches on the evergreens give the illusion of layers of fronds. More Satins on the grasses, the tree inside the barn is over one... Hay is made with long stitches, and Smrynas dot everywhere for little bits of texture. The scene is peaceful and the verse, although it doesn't rhyme, does have a message! Over us will shine a star... sending its gleam of hope to the world. Offered as a chart, coded for hand-dyed silks or DMC. 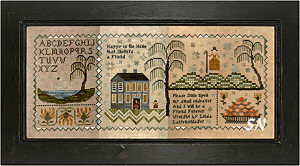 Another of Chessie's darling little house pieces, this companions her Liberty Inn, Hallow Wee House and Glory House. 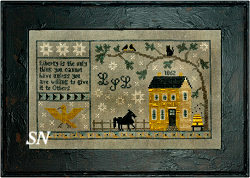 Offered as a small kit, 36ct Vintage Examplar Lakeside Linen and lengths of Gloriana's silk in Antique Black, Antique Dark Gold, Black Cherry, Granny Smith Green, Old gold, Thistle Green and Winter White... the colors against the linen are just the richest. 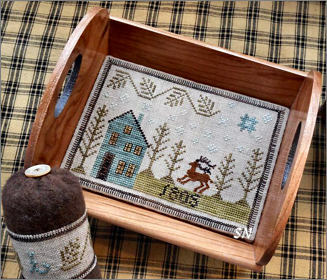 I like the fact that the basket at the top could stand alone as a small project, and of course all of Linda's stitch details. 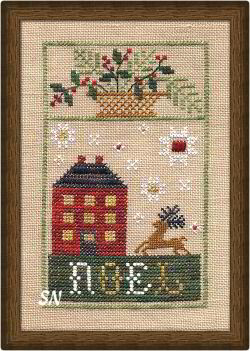 Kind of a companion design to 'Where Stitching Leads' and 'Breath of Autumn', this is a wintery design with a bit of Christmas hinted by the tree and reindeer. The three-sided border and divided sections like the other keep this asymmetric. Lots of Eyelets and Smrynas, I love the lit candles in all the windows. 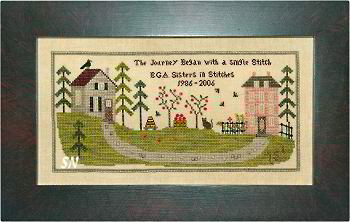 Finishes a petite 6 x 7-1/2 inches on 32ct... charted for silks for DMC. *During the time allotted me, grant my health and my liberty. * Finishing 5 x 7-ish on 32ct, stitch this in silks or flosses. 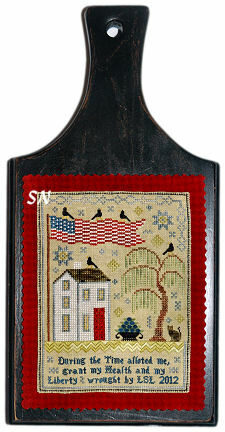 The border is Nun's Stitch, the verse, birds and flower basket are all over one, the yard features Satins, and the door is constructed of 6 Eyelet stitches over 6 threads. Lots of small detail... so pretty! You'll notice that it is cut out just beyond the Nun Stitch border, shown mounted on a piece of Week's hand-dyed wool -- several of the thread colors match that wool, so you have lots of color options there -- and then glued to a Priscilla's Pocket Hornbook. I especially like that bit of wool behind the pieces -- really makes the thread colors pop, so it'd be a neat treatment to use even if you are framing this. Grand Old Flag Sampler is offered as a chart. 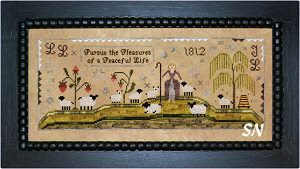 This is a lovely piece -- it finishes approx 4-1/2 x 9 on 32ct linen, and is worked in silks or DMC flosses. The rolling hills in this are STUNNING. Stitched with 4 different shades of threads, they really draw your eye. Flowers are over one, as well as the verse and alphabet. Linda accidentally left out the *L* (which is funny, because that is her initial!)... so there is a bitty chart addition to get that back in there!!! Over-six Eyelets in the roof and a tiny Satin Stitch beeskep, the pic might look pale... but the colors in this are rich and bold! Offered as the chart. Oh this is cute! A miniature thing... it measures just 2-1/2 x 3 on 36ct, and is shown mounted to a bitty Priscilla's Pocket black painted hornbook. Again, great specialty stitches for texture, and the crisp Nun's Stitch edge treatment. Depending on the size of your tree...you might be able to get away with turning this into a Christmas ornament... sewn OR on the hornbook! Offered as a chart. Chessie's third annual house kit... all of these have been cute, this is no exception! Stitched on 36ct Vintage Examplar Linen by Lakeside with Gloriana Silks... you get the 4-thread Eyelets, over-one birds and baskets, all in a really cute 3 x 4 design. Check out the jazzy roof... and the rich colors...! Offered as a complete kit, this'll stitch in a jiff. *A friend reaches for your hand and touches your heart. * This piece could almost be broken down into 2 smaller pieces. Stitch just the top half -- the urn, verse and alphabet -- or just the bottom -- a pretty house amidst the rolling grasses. OR... just the urn and make it into a pin cushion!! 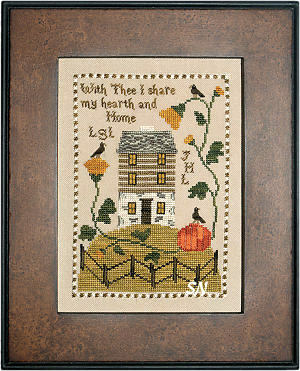 The main piece measures approx 5-1/2 x 7-1/2, stitched on 32ct in silks or DMC flosses. All the specialty stitch charm of Chessie, and again a pretty color of hand-dyed wool behind the piece for a punch of color. 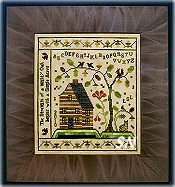 Offered as a chart... the hornbook featured in the pic is available separately. Chessie & Me has a new set of designs that can be mounted to the top and inside of a paper mache box, or framed, or maybe just a soft sewing case. 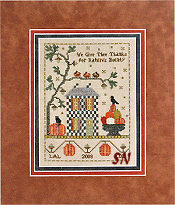 The main 2-1/2 x 4 design -- house beneath the tree with squirrel perched atop pumpkins is worked on 35/36ct linen with Crescent and Week's flosses. In the pic you can see that there is Week's Whiskey Houndstooth wool behind the stitching for a bit of extra color, and this is mounted on the top of a painted box. 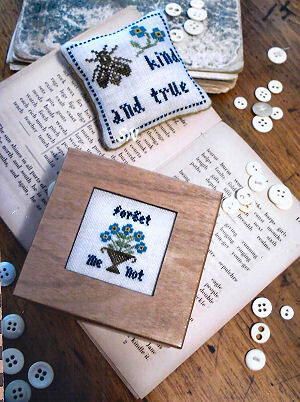 The two smaller companion designs 2-1/2 x 3 and 1-1/2 inches square, feature that little squirrel again, and more acorns. Make those into a scissor fob, the box lid lining... or possibly inner pages of a soft sewing case. Pretty Autumn colors... the wool against the black painted box is pretty... and we have SEVERAL great color options for that extra touch. All three designs are included in the chart, and only Smyrna and regular crosses are featured. Since every piece is so small, this is a WONDERFUL way to use up misc unmatched bits of linens you have -- like a 3 x 3 for the fob!!! Check your stash... or we can send something pretty for all three pieces! 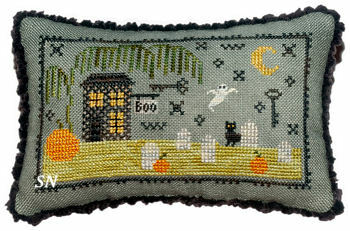 Hallow Wee House Chessie's second seasonal house (last year's was patriotic), this is worked on 36ct Vintage Pear Lakeside Linen with 6 different shades of Belle Soie and Gloriana Silk. It features the same stack of pumpkins as the Autumn Sewing Book, but a stone house, pumpkin patch and early evening sky. Finishing a mere 2-1/2 x 5, these finish into great little block stand-ups. 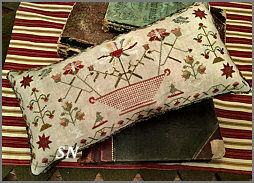 Offered as a complete kit of the linen and silks, just a fun smaller project. 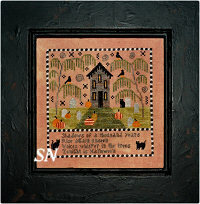 A long and skinny piece -- just a dark farmhouse with crows in the yard -- and a graveyard in the front!!! The headstones don't hint initials of anyone special... if they did, that *would* be scary! Belle Soie hand-dyed silks on hand-dyed linen, this finishes a mere 3 x 7. The fronds on the willow tree are long stitches over 8 threads -- alphabet is over one, we have Smyrna and Satin pumpkins -- great hand-dyed color in this small piece! Offered as the chart. 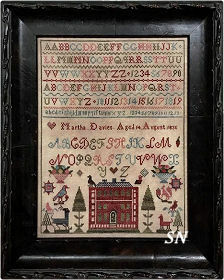 The beautiful distressed black hornbook frame by Pricilla's Pocket will be in soon... reservations available below. Chessie & Me has several new releases -- Lulu's flock is one of my favorites. 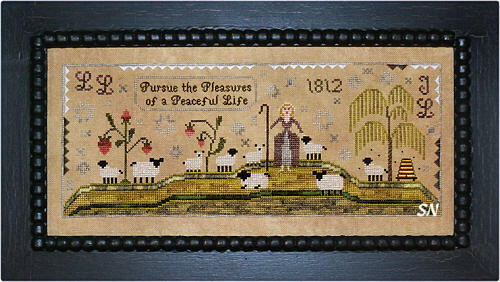 'Pursue the Pleasures of a Peaceful Life' is the offered advice... in this charming pastoral scene. Stitched on 32ct linen in Crescent Colours hand-dyed cottons, there are Eyelets, Smyrnas, Long Armed Crosses and Satin stitches scattered everywhere in this. You don't notice them at first, but when you finally do, you fall in love with the textures they add. Everyone is used to seeing specialty stitches in a band sampler -- but not so much disguised in a picture or scene. The colors are pretty -- pinks, greens and creams of Avocado, Clay Pot, English Ivy, Pea Pod, Rosy Glow, Weeping Willow -- there are 13 in all -- to stitch this 5 x 12 piece. I like the hills, all the sheep, the willow fronds and that zig-zag border that is uneven! Offered as a chart. Ooohhh, this is a pretty little thing! Stitched on 36ct Vintage Pearled Barley Linen by Lakeside with seven different colors of Belle Soie Silk, this finishes a mere 2-1/4 x 4! The colored picture that comes in the kit is basically actual size. Touches of one-over-one, and some Rice and Smryna Stitches, the silks are Attic Tea, Chocolat, Icing, Mer Bleu, Puritan Blue, Red Fox and Weathered Vine. Just a fun Americana-flavored project, it's kind of a steal because the linen and 18-inch lengths of silk are all included. (silks run $7.50 per skein otherwise!) Full of Chessie Charm! Super pretty edge treatments on this 5-1/4 inch square design -- notice the 4-Sided Stitch all around, and then the extra border on the right edge. I like the un-balance of that! 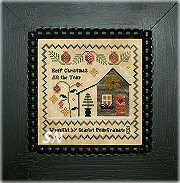 Just like the rest of Linda's designs, this is loaded with Satin Stitches, some one-over-one, and lots of design detail. Fun finishing for this as well. After your stitching is finished, hit the big-box craft store for a hunk of wood, paint it with acrylic paint, sand it a little, BriWax it next... and you have that awesome paddle! 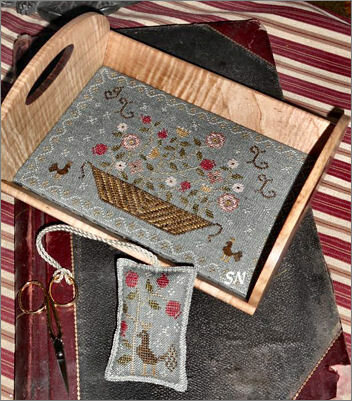 Then, choose a small piece of wool felt -- pink the edges -- tack your stitching onto the wool and glue IT to the paddle. A neat way to finish something -- other than a super-expensive custom frame job. Scarlet's Summer is offered as a chart, and calls for Belle Soie and Glorianna hand-dyed silks or DMC flosses. Two new Chessie designs for Needle Books -- both offered in chart format. 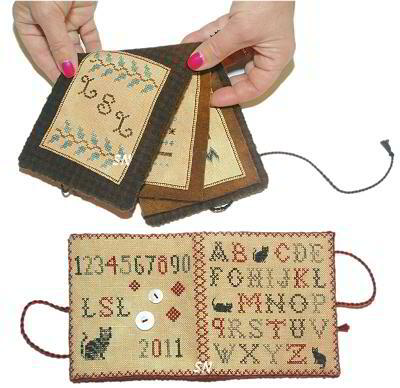 Simple stitching on the alphabet one, simple finishing on both, the Needlebook of Stitches is designed to look like a Primer, or just practice pages of different stitches. Both are stitched with Week's Dye Works flosses and feature Week's wools in the finishing. Easy and fun! Chessie & Me has released three new Autumn-flavored pieces... and I love them ALL! *The Breath of Autumn is a whisper to the soul. * We're in the middle of one of our hottest summers on record in Oklahoma... it hasn't been below 100 degrees for a month! I saw the little turkey on this piece and promised that on Thanksgiving this year... I would look back at the summer -- and then be thankful for November weather!!!!!! A cute sampler full of Autumn flavor -- this is stitched on 32ct Country Mocha Belfast linen in lots of gorgeous Belle Soie silks from Crescent. 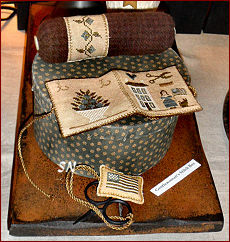 Linda always tucks lots of specialty stitches into her pieces -- I think it adds so much texture and curious-ness! 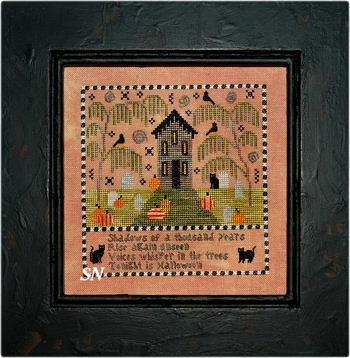 Only 6 x 7-1/2 inch in size... the pumpkins, roof and acorns are Satins, the Pomegranite urn and verse are over one, there are lots of Smyrnas and Elongated Crosses... very pretty! Offered as the chart. 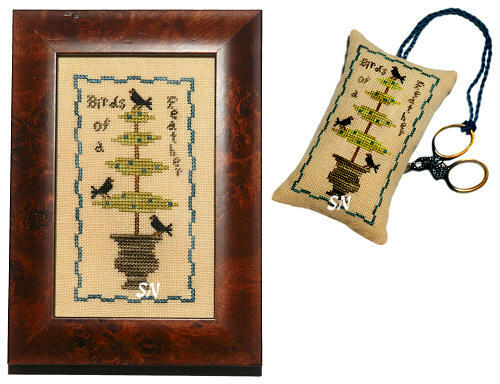 This year's Chessie Scissor Fob kit, Birds of a Feather is darling! Offered as a complete kit, it includes a cut of 36ct Vintage Luna Lakeside Linen, 5 lengths of Belle Soie and Gloriana Silk, and the small chart. Just a small thing, pretty colors, I love the POP the aqua-blue gives against the dark, bitter apple green! We have the little fob kits from the last several years father down the page. Scarlet Pomegranate's newest pin cushion design, this can be stitched in silks or DMC -- 3371, 316, 902, 732 and 948 -- it's small, and works up to be almost 3-1/2 x 5. Little Scarlet is stitched over one, and the pomegranates are all worked in Smyrnas! 'The strength of a mighty oak begins with a single acorn.' Chessie & Me has several new releases... I liked this one to feature on Just Arrived... it has so much detail and charm! 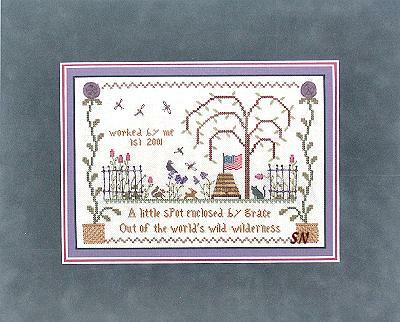 A mighty oak tree offers protection to the log cabin, and home to lots of little forest and garden creatures -- check out the birds, squirrel, and even little Chessie the cat sitting in the grass -- they're all stitched over one! Lots of specialty stitches scattered all over in here -- the grass is solid Satin Stitch -- it just shimmers! There are Rhodes, Eyelets and queens scattered everywhere for bits of texture, and the colors are just wonderful. Finishing approx 7 x 8 on 32ct Linen, this is stitched with 11 different shades of Belle Soie silk by Crescent Colours. Teddy Bear, Paprika, Harvest, Attic Tea, Herb Garden, Tortoise Shell and Noir... I pulled them all together -- just a yummy collection of colors! Chessie's 2010 Limited Edition Scissor Fob/Ornament is darling! Stitched on 32ct Vintage Meadow Rue Linen from Lakeside, the colors of Belle Soie Silk included are gorgeous. 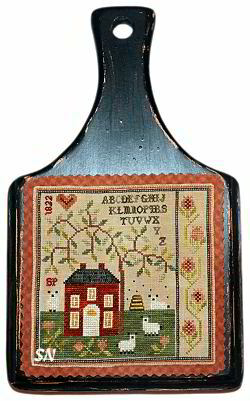 Creme de Menthe, Herb Garden, Old Crow, Red Fox, Teddy Bear and Vanilla Pudding... the little sheep body is cross stitched and then scattered here and there with French Knots on top of the crosses. Charming, this finishes approx 2 x 3-3/4 in size -- a perfect ornament size! 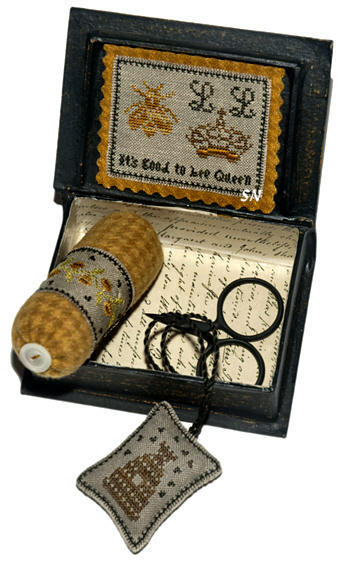 Offered as the complete kit of chart, linen and silks. 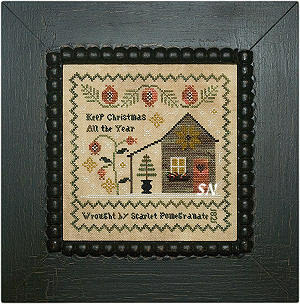 Scarlet Pomegranate has stitched her charming Christmas Cottage -- complete with borders and vines -- the entire piece measures a mere 5 x 5 on the included 36ct Vintage Pearled Barley Lakeside Linen. 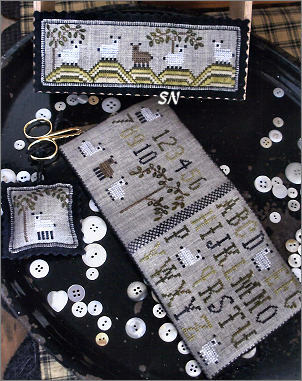 Stitched with a set of Limited Edition Sampler Threads, if you want to use those from your stash instead, the chart is also coded for regular colors in the Sampler Thread line. 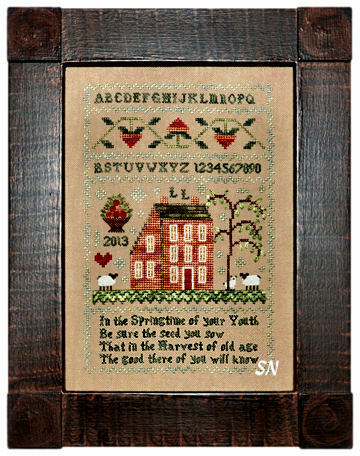 Pretty colors of greens, grapes, bricks and golds, the piece features a few Smryna Crosses, French Knots, and a little bit of One-Over-One stitching. Shakespeare's Peddler had a fun idea this summer -- she has designed the Jenny Bean Samplers, and wanted Jenny Bean's imaginary stitching friends to each stitch samplers as *Friends of Jenny Bean! * So... Scarlet Pomegranate is one of JB's friends! Offered as the chart with linen cut. Well... this is the sweetest little kitty... sitting innocently underneath the fern... it must be a different kitty that would catch the bird and bring it in the house!!! 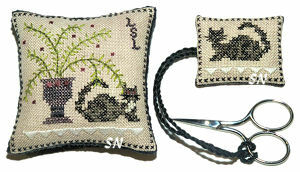 Chessie & Me has several new designs, this cushion and fob are just one. Stitched on the softest and most yummy 32ct Vintage Maple Sugar Lakeside Linen hand-dyed in Belle Soie silks of Old Crow blacks, greys, and Kiwi and Beanstalk greens, the fern is Straight-Stitched (Lazy Daisy would be fun, too), Chessie's rug features Satin Stitched edges. Cushion finishes approx 3 x 3, fob just 1-1/2 x 2. Chessie's fob is two-sided... you see both her front and back! 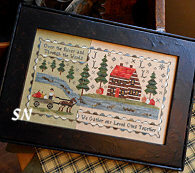 Kit includes the chart, Lakeside Linen, Belle Soie Silk and finishing instructions. 'Strive to excel in every useful skill' (Talk about setting the bar kind of high!) Just focus on your stitching talents for this charming 5 x 5 piece... and you'll be fine! Lots of one-over-one detail in the windows, little Chessie the cat, and that urn in the garden. Tree is Lazy Daisy, the 4-Sided can be pulled a little -- it's the darker frame around the house panel of the piece -- kind of cool -- it 'divides' to accent the strawberry vine! Offered as the chart, this is stitched in DMCs, Crescent Colours and Week's hand-dyed cottons. Linda's classic stone and mortar house with a log cabin upper story... I think I could live here!!! Lovely as a piece to hang in your guest room or foyer, this is stitched on Weeks 30ct Confederate Gray in Weeks, GAST and Crescent overdyed flosses. Lots of Satin Stitches and a few Smryna Crosses, the verse is over one on this piece. Finishing approx 5 x 7-1/2, I love the colors and that lush pumpkin vine overtaking the landscape!!! Offered as the chart. Chessie & Me has several new releases... and I think this one is my favorite! I just love how she takes a normal picture and adds little specialty stitches all over in it... so that as you keep looking at it... you keep finding them! Stitched on Weeks 30ct Straw Linen in overdyed flosses... those rolling hills are stitched in Satin Stitches with a row of cross stitches between the color changes. The color changes in the floss add SO MUCH activity to those hills -- definitely the focal point of the piece. Next, the cottage roof is stitched over 6 threads, using Old Purple Paint Sampler Thread, and is entirely made of buttonhole stitches. It looks just like a thatched roof!!! The little sheepies have Eyelets scattered all over them -- makes their wool coat bumpy! 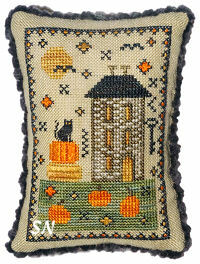 The cottage walls are cross stitched, but irregular satin stitch 'stones' interrupt them! And then, there is that irregular Long Arm Cross and Saw Tooth border going on... this is *charming!!! * Offered as the chart, it finishes approx 5 x 10-1/2 on the overdyed. 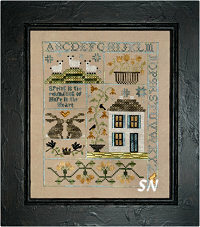 Verse reads: 'This work in hand my friends may see, For them I've stitched a memory.' Finishes approx 5 x 6-1/2... cute! We Give Thee Thanks... For Nature's Bounty. Chessie & Me's newest sampler has the flavor of autumn bursting everywhere! The gnarly oak tree is home to acorns and a haven to a trio of mischievous squirrels all balancing on that branch over the house. 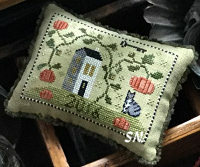 Pumpkins in the yard, and of course, Chessie-the-kitty laying in waiting for those squirrels, this whole thing stitches into a 5 x 7-1/2 inch sampler. Weeks 30ct Confederate Gray linen is included with the chart... you add the flosses. As always, lots of Satins, Scotch, Smyrnas, and Eyelets in here... it's really fun to see special stitches *worked into* the design rather than simply be border or row stitches. They define the shutters, pumpkins and acorns! My heart gladly follows! 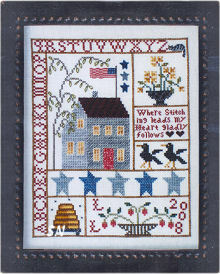 Chessie & Me's newest sampler design, this has a summer flavor to it, I think, because of the flag and all the stars, the black birds and the beehive. 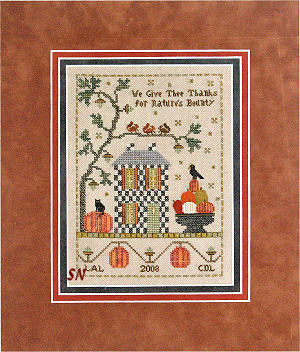 Offered as the chart, this is worked on 30ct Cream Assisi Linen -- which is included in the package. A super-heavy quality fabric, you will be using only ONE strand of floss and Tent Stitches (1/2 of the cross stitch) to get the desired weathered effect on the house. Worked in DMC and overdyed flosses, there are lots of satin and scotch stitches in here -- roof and beeskep. Lazy Daisies form the leaves, and you can make some of them overlap the roof, if you want! 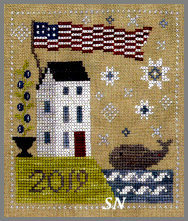 There are Smryna and Eyelet stitches scattered throughout, and the flag is worked one over one! Finishing approx 6 x 8, I just love Linda's things, because little Chessie the Cat is always tucked in somewhere, and while you're looking for him, you find all the stitch details! Charming! 'The Journey begins with a single stitch.' 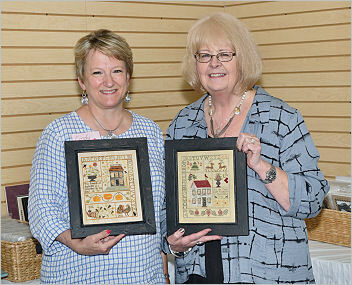 I believe this piece commemorates an Embroider's Guild event... so you'll need to celebrate your own event... but what a neat thing to stitch for a best friend in your stitch group? I absolutely LOVE the design composition of this piece. Colors, balance, houses, path, and trees... all of it! The next in Chessie's endearing farm house scenes, Bittersweet is stitched on a delicious piece of 32ct Dye Pot Blend R & R hand-dyed linen. It's a rich golden color that accentuates the overdyed flosses called for. Finishing approx 5-1/2 x 6, it's full of one-over-one detail, and Smryna Crosses -- both regular and elongated. The pumpkins are in the yard, the kitty is on the roof.. darling as always! The chart includes the fabric! Another of Chessie neat house designs that looks so traditionally American in flavor. Black Crow, Black Raspberry Jam, Gold Leaf, Grape Leaf, Maple Syrup and Mulberry... I just love the colors in this! 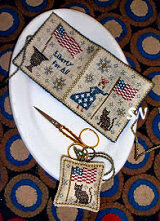 I especially like that patriotic pot of flowers with the flag... pull that out and stitch it individually! 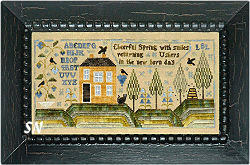 Lots of fun stitches, lots of texture and interest, this measures approx 6 x 7 on 32ct. Offered as the chart. 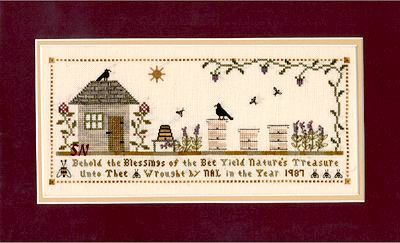 A delightful little garden scene, it's full of Chessie's traditional bumblebees, always a flag somewhere, and teeny specialty stitches to add lots of texture and points of interest! This design uses lots of golds, browns, grays and luscious plum colors... we just love our stitched model! Available as a chart. 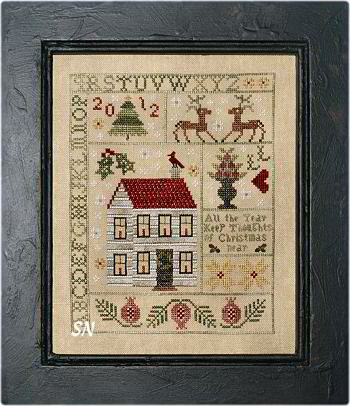 A wonderful set of spindly trees, primitive star borders, and a clapboard house, the basic design of this sampler is really very simple. Upon studying the chart... that little house is full of different special stitches that make up each of the ten clapboards!!! Really cool! It uses overdyeds in Schneckely, Cherry Bark, and lots of regular mosses and taupes, and finishes approx 18 x 7" on any 26ct linen. Available as a chart. 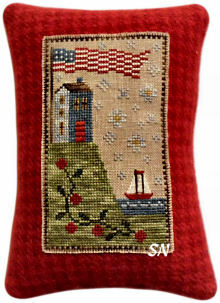 Here's a nautical-themed sampler-style picture featuring a sailboat in a small inlet... protected by a lighthouse. The border of waves is stitched in Chesapeake Blue overdyed floss, and the rest of the piece shares both Weeks Dye Works and Gentle Art Sampler Threads colors. 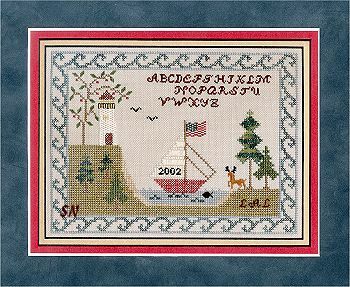 Really charming, the alphabet is stitched over one thread, while there are special stitches complementing the lighthouse, sail, and trees. 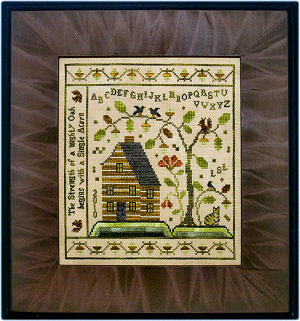 Finishing approx 5 x 6-1/2," the 32ct hand-dyed "Chessie's Mill" linen by R & R Reproductions is included in the chartpack! Just stunning! Here's something wonderful we've 'unearthed' in our move! Now that we have a little more room in the shop to display things, we remembered how neat this design is! Stitched over one thread on 32ct natural linen, in rich overdyed reds, burgundy, deep blues, creme and golds... this is a tiny flag worked in special stitches! Finishing a mere 2-1/4 x 3", our little brick is finished into a bitty 2 x 3 x 4"! The stripes on the flag alternate between satin, scotch, smyrna crosses, eyelets and algerian eyes, rice, cross, and straight stitches! It's just exquisite, and available as a chart! This is a delightful scene of a beekeeper's cottage, and hives! Parts of the design are stitched over one thread of linen, for extra detail, and most of it is stitched in lavender, gold, sage, and creme overdyed flosses. It's a charming design, talking about the bees yielding natures treasure -- their honey! 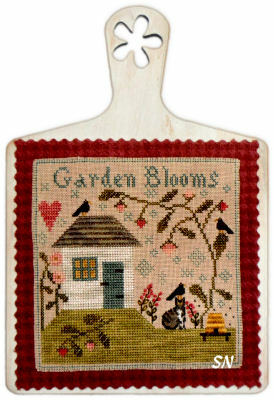 Very pretty for a kitchen, or garden room, it finishes 3-1/2 x 9" on 32ct... and is available as a chart.